It’s good to see that VCE isn’t the only converged infrastructure stack provider out there who has realized that solutions are going to be hugely important to customers. As part of the team who is tasked with finding out what our Service Provider customers want to implement on top of Vblocks, working with the VCE team to develop, test and validate that solution and then working with those customers to create a business model around how to generate revenue, this is a subject that is dear to me. If, as I posited yesterday, the infrastructure is boring and we need to start focusing on the users, business and the applications, this solution development process will become an increasing differentiator for companies who invest in it, and do it well. Application Mobility Whitepaper – This is a very cool whitepaper showing how to connect multiple Vblocks in an end-to-end architecture designed to migrate applications from data center to data center with zero downtime and minimal performance hit. It’s a great overview of the VPLEX product in conjunction with the Cisco DCI stack and VMware vMotion over distance. While this paper was written using the first “Metro” version of VPLEX, I’m sure we’ll see an update now that “Geo” has been released. Vblock Solution for Greenplum – This solution (IMO) was one that we did just to show that it could be done. 🙂 In addition to the specific 700-series architecture that is referenced, we have many customers who are using the Greenplum Community Edition virtual appliance on a Vblock to handle smaller data sets or to develop against the stack in a test/dev setting in conjunction with the full Greenplum DCA. There are a bunch of great customer case studies around these solutions and their success with the Vblock platforms in general. SunGard Case Study – From an SP standpoint, this is one of my favorites. Cobweb Solutions Case Study – Another great SP story from EMEA. 5 days to implement, 10,000+ Exchange seats, 100% predictable costs! Next we have the “Application Solutions”, or the design and reference architectures for specific apps. Personally, I look at these as “table stakes” for any company looking to put out a comprehensive solution stack. 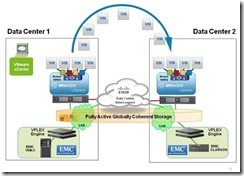 SAP – VCE has really done a great job here, in my opinion. There are currently six different documents available for SAP users, and there are 5 more white papers and a full Solution Architecture on the roadmap for the coming months. 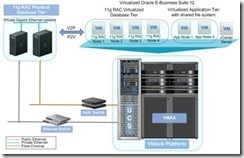 Oracle – One of the primary concerns that customers have with virtualizing Oracle is the FUD that Oracle themselves introduces with their vague and confusing support statement. Part of that statement includes reference to making customers replicate an issue on physical hardware in some instances, and so VCE has put out a document on how to alleviate this issue. VDI/View – Good, comprehensive reference architecture for Windows 7 clients. I like this because there’s a ton of good data presented, with complete transparency around how the testing was done, the results and the assumptions made. There is also a industry/vertical-specific View white paper (check the next section down) and a whopping 5 additional Solution Architectures on the roadmap! ITSO/ITSM – This is one place where I feel like VCE has been very proactive and open, and it’s a huge benefit for our customers. When you converge the infrastructure down into a product, you should be obligated to provide guidance and support for customers when it comes to orchestration, management, metering, etc… With the fact that there’s a fully published API for the Vblock platforms, customers have so many options for using the tools that we can provide as part of the product, using the tools they already have in place or developing their own. Vblock™Infrastructure Platforms – Guidelines for Metering and Chargeback Using VMware vCenter Chargeback – This is a great document, and one of the cornerstones of the forthcoming “vCloud Director on Vblock” solution. Automated, Self-Service Catalog on Vblock™ Infrastructure Platforms Using CA Technologies – The recently announced partnership with CA is very exciting to many of us inside VCE. Flexibility is the key in the ITSO/ITSM space! Next, we have the Industry/Vertical focused solutions developed with and for our customers who have specific needs based on how their business works. On a day-to-day basis I work inside this team, and I’ve been gratified to see the amount of interest our customers have shown toward these solutions, and I’m also amazed at the amount of work it takes to put one of these out. I consider these “second order” solutions, with the general application solutions being the first tier, so you will see this group expand rapidly over the next few months! Leverage Vblock™ Infrastructure Platforms to Transform Retail Banking – A great paper focusing on retail banking environments. Lots of opportunity in this space, and my co-workers Jae Ellers and Michele Ahlquist did a fantastic job on this paper. 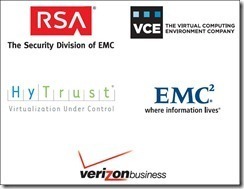 VCE Virtualized Data Center for Retail / PCI Solution for Retail 2.0: Simplifying Compliance – In conjunction with our friends at Cisco, EMC, RSA, HyTrust and Verizon, this is a great solution to address the always popular PCI DSS compliance concerns. Leveraging Vblock Systems for Smart Grid Success – Tom Chatham and Laura Lazarescou have put together a great look at the energy industry, where Smart Grid is relevant and how the Vblock can make a big difference in delivering that solution at scale. Look for more of these kinds of resources around the Education, Federal Government (including a fascinating “Community Cloud” concept involving GIS services), Public Sector, Manufacturing and more! Finally, we have the Service Providers, which in addition to being able to use most of the previously mentioned solutions in a multi-tenant/multi-purpose fashion have some specific requirements around IaaS/PaaS models. I don’t have a lot of publicly available information to share here, but look for some huge announcements with our friends at VMware and Cisco as we get closer to their respective industry events! Hopefully this overview of all of the solutions that VCE has brought to market already, along with some insight into how those solutions will continue to evolve and expand going forward has been useful. If you have specific questions about any of the solutions please leave a comment (full disclosure appreciated, please) below, and if you are under a VCE NDA and would like to see the full roadmap out through Q1 2012, call your sales team and ask for a roadmap presentation! The roadmap is updated every quarter, so make sure you’ve seen the latest one to see how comprehensive the Vblock story is and the level of engineering integration with our parent companies.